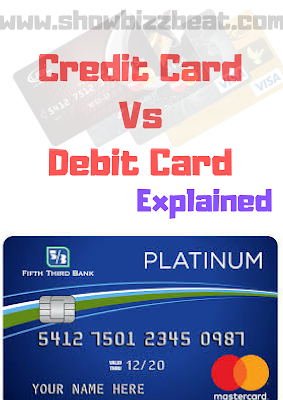 Debit Card Vs Credit Card Explained. When you enter into the banking age, I mean the age when you are going to open an account in a nearest bank you will probably think about the card selection or will be thinking about the types of cards. Well the functions of both the cards are same but there exist also a little difference between them lets discuss them in detail. When any one open an account weather it is (current or saving account no matter), you will be given a basic debit card to most of the people in Pakistan the banks issue the Pay Pak Debit card while in India the banks provide PaYsa Debit card. These cards does not work for online shopping, Some of them work on line but you have to first register them by calling to the call centre and then you have to pay an extra money to activate the session which will only lasts for some hours or a day. I will prefer Debit card to you if you are a newbie in the Banking sector later on you can convert it to the other. Credit Card is given to those account holders / customers who have a good package of Monthly Salary along with some other official documents, this card works same as debit card works ie. you can withdraw money from any ATM, you can swipe it anywhere for shopping, but the additional advantage is that if you do not have a money in your bank account you can also withdraw some money from ATM as a loan which has to be returned in a given time period (every bank has it's own policy). The additional benefit of Credit Card is that it can be used all across the world and it does not require any additional charges or activation process it is a one time activation card which can be used all across the world till the time it expires.